ایس وکھالے دا ناپ: 489 × 599 پکسلز۔ دوجے ریزولوشنز: 196 × 240 پکسلز | 392 × 480 پکسلز | 489 × 600 پکسلز | 627 × 768 پکسلز | 835 × 1,024 پکسلز | 1,574 × 1,929 پکسلز. English: Daguerrotype of Emily Dickinson, c. early 1847. It is presently located in Amherst College Archives & Special Collections. 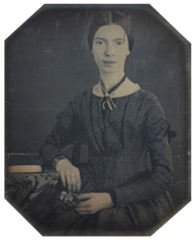 Original version with frame File:Black-white photograph of Emily Dickinson2.jpg.